Moon Neo 230HAD review | What Hi-Fi? It’s been a long time since we’ve reviewed a Moon product – more than six years, in fact – but we’re always excited to see something new from a company with such great hi-fi credentials. This little unit is a something rather different than we’re used to from Moon and Simaudio. It’s the company’s first DAC aimed squarely at a desktop audience, featuring a headphone output and a much more desk-friendly size, measuring even narrower than the Naim DAC-V1. As part of the company’s Neo range, it’s also cheaper than a lot of Moon products we’ve seen. While some of its components can reach executive car prices, the 230HAD comes in at £1150. The 230HAD is based heavily on the reference 430HA headphone amp, its compact size giving it the upper hand over its pricier sibling for those looking for a desktop set-up. Of course that doesn’t mean you can’t use the 230HAD as part of a more traditional system. With two coaxial inputs, one optical and an analogue in, this could quite happily double up as a preamp for any digital source, offering both fixed and variable outputs to connect to your system. The USB-B input is likely to be the most heavily used though, allowing you to hook up your laptop and use the 6.3mm headphone jack for a more straightforward, digital-focused set-up. The Neo 230HAD supports a wide range of audio including PCM files up to 24-bit/192kHz and up to 32-bit/384kHz (plus DSD64, DSD128 and DSD256) via the USB input. Looks-wise, It’s a cleanly designed unit, crafted out of aluminium and solidly made to minimise resonance. While the sides offer a rougher look, the front panel has a brushed-metal finish, housing the standby button, input switch and input/sample rate indicators. The latter illuminates automatically to let you know what sample rate you’re playing, while the former will cycle through the inputs (which correspond to the labels on the back panel) as you click the input button. There’s no screen here like there is on the Naim DAC-V1, which is a shame, but it’s still more straightforward to operate than the Chord Hugo. There’s a remote included – it’s a little cluttered, but can double up as a system remote for your Moon amp and CD player. Plug in some headphones for a 24-bit/192kHz play through of Electric Light Orchestra’s Mr Blue Sky, and the 230HAD immediately shows off a bold, open character, jumping straight into the bouncing guitar instrumental with a good sense of drive and enthusiasm. There’s a good level of detail here, and a decent amount of space too, but the Chord Hugo still comfortably bests it for out-and-out subtlety and transparency. It’s not as precise with its rhythms as the Naim DAC-V1 either and doesn’t offer quite as much punch as it should. What it offers in return though, is a lovely fluidity to its midrange that the Naim can’t quite match, and with more body than the Hugo can manage. This gives it a more relaxed, easygoing character than the Naim. It might not be as meticulous in its accuracy, but in many ways creates a more enjoyable and engaging sound for extended listening. That said, we would like to hear a tad more organisation during more complicated rhythm patterns. When a song gets busy, the 230HAD can lose its handle on one or two of the rhythmic elements, meaning the song as a whole doesn’t tie together as seamlessly as with the Hugo or DAC-V1. The 230HAD does a good job with dynamics for the most part, particularly with big bold dynamic shifts where it can really let loose. It can go eerily quiet too, although low-level dynamics aren’t quite as expressive as the louder ones. For example, the saxophone intro to a DSD play-through of Marvin Gaye’s What’s Going On is full of expression, texture and detail as it soars louder, but the softer notes in between don’t manage to communicate themselves as well, or differentiate themselves from one another, to the same degree. In terms of balance, it’s a fairly neutral listen, but with a weighty enough bass that gives it a little more substance than the Hugo’s leaner presentation. We do notice the treble showing itself to be a touch harsh with some recordings, highlighting some sibilance in the less-than-smooth Forgiven by Alanis Morissette, which its competitors glossed over. The effect is minimal though, so as long as you take care not to partner your Neo with bright-sounding kit it shouldn’t be an issue. 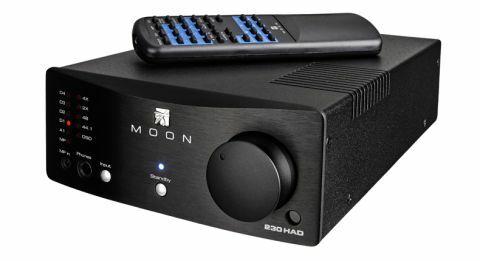 At £1150, the Moon Neo 230HAD is far from cheap, but it does sit at the lower end of the price scale compared with the Naim (£1250) and the Hugo (£1400), and it does a good job to largely hold its own against these DAC supremos. There are some issues – it needs to maintain its composure better during busy rhythmic patterns and we’d like a touch more punch too, but it’s hard to argue against its smooth, fluid character that creates a hugely enjoyable listen. At this price, it deserves an audition.